Want to see a little art? 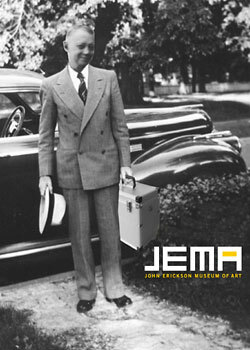 The John Erickson Museum of Art is a location variable museum. 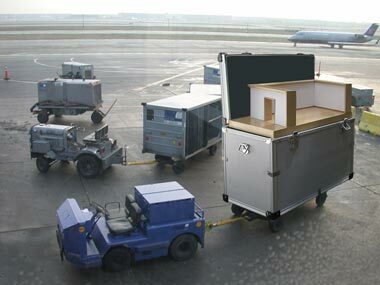 It does not have a fixed address and is designed to be portable and movable. In a sense, all of its exhibitions are travelling exhibitions. As part of its Museum Stealth Initiative JEMA frequently travels to venues that are architecturally larger in scale to gain a greater audience. April 4 – 6, 2014. Art Museum Dust Collection Art Multiples Produced in collaboration with Connie Hwang these multiples are a component to my ongoing Art Museum Dust Collection. The Art Museum Dust Multiples are carried in museum stores and art venues such as Printed Matter Inc. NY, NY, Contemporary Museum Baltimore, MD, Denver Art Museum, Seattle Art Museum, North Carolina Museum of Art, Walker Art Center, MN (2005-13), and Obscura Antiques & Oddities. How to Start Your Own Country, Director Jody Shapiro, Everyday Pictures Inc., Canadian Broadcast Corporation, 90-minute film documentary, Docville International Documentary Film Festival, Leuven, Belgium, April 29 – May 7, 2011, Canadian Broadcast Corporation, CBC Television, Documentary Channel, Sidney International Film Festival, Sidney, Australia, Istanbul International Film Festival, Istanbul, Turkey, , IFCenter, International Film Center, (as part of the Stranger Than Fiction series curated by Thom Powers), New York, NY, The 24th International Documentary Film Festival Amsterdam, Amsterdam, Netherlands, 90-minute film documentary, DOK Leipzig, Leipzig, Germany, Film includes documentation of John Erickson Museum, Documentation of Art, Performance, Collaboration, and interview with Gregory Green (Free State of Caroline Project) and Sean Miller (JEMA). Provo, Utah, October 20th, 2011. Seattle, Washington, Oct. 21, 6-10pm. Bristol, United Kingdom and Barcelona, Spain, September 24th-November 19th, 2011. Museum Expansion: Sean Miller and JEMA collaborative works with Connie Hwang, Jess Larson, Wes Kline, and Cristian Segura. Gainesville, Florida, August 30 - October 3, 2011. Tampa, Florida, April 7th, 2011. Sean Miller with Thom Hutchinson, 2011. Morris, Minnesota, March 2nd, 2011. San Francisco, California, February 24th, 2011. San Jose, California, February 22nd, 2011.
co-authored by Kelly Cobb and Sean Miller, Volume 8, Number 3, November 2010, pp. 286-303(18). Brooklyn, New York, October 11, 2010. June 4-June 17, Belfast, Northern Ireland, U.K.
Genoa, Italy, June 4-August 29, 2010. Tallahassee, Florida, February 25th, 2010. Chicago, IL, February 10, 2010. Berlin, Germany, June 26th, 2009. Genoa, Italy, March 13th, 2009. Curated by Caterina Gualco, JEMA and LuLu LoLo, performance art interventions at Villa Croce Museo d'Arte Contemporanea, Museo di Strada Nuova, Museo di Nervi, Galleria d’Arte Moderna of Genoa, and UnimediaModern Gallery, Genoa, Italy, March 11-15, 2009. Belfast, Northern Ireland, March 6, 2009. Campagna, Italy, July 15 – August 16, 2008. Baltimore, MD, May 31 – August 24. Indianapolis, IN, May 2 – August 10. Weimar, Germany, March 29 – May 18. Belfast, Northern Ireland, United Kingdom, April 9 – April 27. Belfast, U.K., April 9, 2008. Belfast, Northern Ireland, United Kingdom, April 3 – April 30. NY, NY, September 8, 2007. Berlin, Germany, July 13 – August 11. Weimar, Germany, June 6 - August 8. Mark Takamichi Miller exhibition, One Hour Photo Paintings. Paper and slides presented, The John Erickson Museum of Art: A New Museum Space. The flight of JEMA and Sergio Vega's High Art over the city of Miami in a banner plane advertising High Art exhibition. Followed by an opening for Vega at the Art Basel VIP Lounge. Museum as Archive Archive as Museum Symposium, paper and slides presented, Museum Grounds.